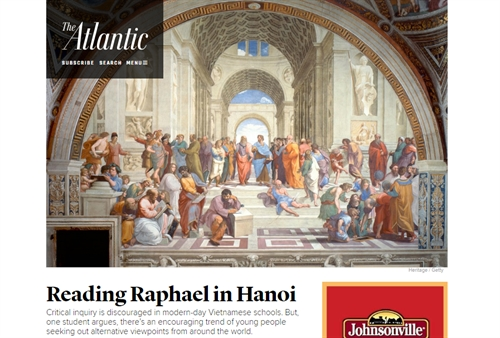 Great minds: The School of Athens, one of the world’s most famous frescoes by Italian painter Raphael was the subject of Nguyễn Tiến Thành’s essay "Reading Raphael in Hanoi". HÀ NỘI — Nguyễn Tiến Thành a student from the Hanoi-Amsterdam High School was named as winner of the second annual student Writing Prize, a competition organised by American The Atlantic magazine and the College Board, a non-profit education organisation. Thành’s essay, inspired by The School of Athens – one of the most famous frescoes or murals by renowned Italian artist Raphael during the Renaissance – was selected for the prize among 2,000 entries from 44 countries in this year’s contest, which challenged students to do a close reading of a work of art that inspires them. Two dozen professors of composition and art history narrowed the field to 20 semifinalists, and a panel of judges from the College Board and the magazine made the final selection. The fresco, which was painted between 1509 and 1511 under the commission of Pope Julius II, depicted some of the most prominent thinkers and great minds of history such as Plato, Aristotle, Socrates, Leonardo de Vinci and Michelangelo. In his essay, titled "Reading Raphael in Hanoi", Thành not only pointed out that all the figures in the fresco share one thing in common - a quest to pursue knowledge and make sense of the world - he also pondered the meaning it conveys for the viewer. His interpretation highlighted the artist’s intention for his work to be an invitation, one that encourages viewers to engage with “the great thinkers of the past” and “to learn from or question their ideas”. Thành also expressed his regret that the education system in Việt Nam still lacks such an “invitation” and instead often constrains students to a “limited exploration of a narrow range of ideas” and tends to promote a “single worldview”. However, he said enthusiastically that even though the current system may take some time to change, the younger Vietnamese generation is both well-equipped and eager to learn of different ways of the world. To end his essay Thành concluded that “the great thinkers are there not for us to respect unquestioningly, but rather for us to question respectfully” and pledged himself to be an upholder of intellectual freedom and critical inquiry in his quest for knowledge. 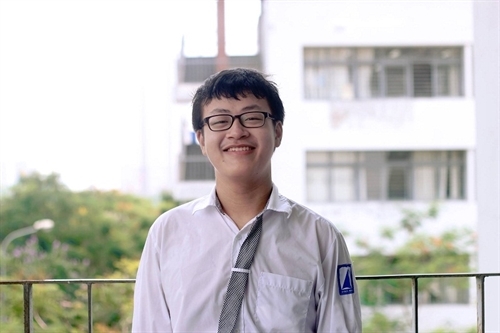 Along with the prize, Thành, 18 and a recent graduate from high school, has also won a US$300,000 scholarship to Duke University, which he plans to attend this autumn. Sharing his tips for academic success, he said one of the first books he read in English, one that inspired him to learn the language, was the classic Pride and Prejudice by Jane Austen. Quest for knowledge: Nguyễn Tiến Thành, 18 from the Hanoi-Amsterdam High School and winner of The Atlantic magazine’s Writing Prize this year.